I am a professional in the financial services industry. Some clients want to take more of a hands-on role in the process; others want nothing to do with it. Either way, my goal is to make sure you can have added confidence in the knowledge and decision you make today that will affect the outcome of your money tomorrow. If after talking together, you decide the work I do will work for you – the next steps are simple. We will start by taking a 360 degree view of your financial world based on what you have today and what you want to have in the future. This includes an outline of your present position based on your income, expenses, current benefits, protection, savings, and growth products you are using. Next we will outline the pros and cons of each of those areas to be sure the financial products you are using currently to warehouse your money and/or help protect your money, are working in a coordinated and integrated fashion. 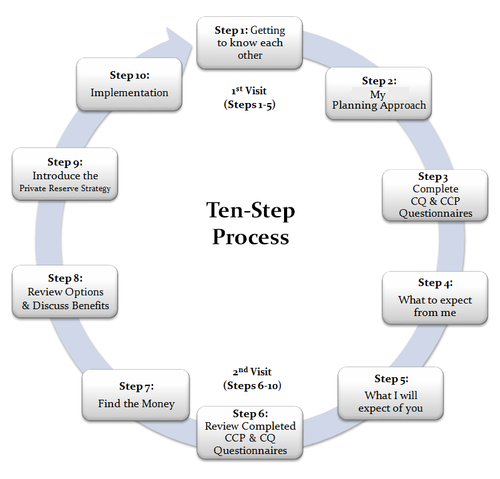 That process will lead to a discovery process of whether you have hidden costs and possible losses to each of those areas. We will then measure the dollar cost of each financial transaction you are making. The approach and overall strategy is to find money you are unknowingly and unintentionally transferring away and then bring those dollars back to the table to improve your overall access to cash without additional risk. My goal is to help you reduce your costs without changing your current lifestyle. Together we will create a measurable plan of action designed to help you achieve what you want to have happen in the future. Investment Advisory Services offered through Retirement Wealth Advisors, Inc. (RWA) an SEC Registered Investment Advisor. Advanced Capital Group, DBA Partners for Prosperity and Gina C Wells Financial Services, are not affiliated with RWA. Investing involves risk including the potential loss of principal. No investment strategy can guarantee a profit or protect against loss in periods of declining values. Opinions expressed are subject to change without notice and are not intended as investment advice or to predict future performance. Past performance does not guarantee future results. Consult your financial professional before making any investment decision. This information is designed to provide general information on the subjects covered, it is not, however, intended to provide specific legal or tax advice and cannot be used to avoid tax penalties or to promote, market, or recommend any tax plan or arrangement. Please note that Advanced Capital Group, LLC, and its affiliates do not give legal or tax advice. You are encouraged to consult your tax advisor or attorney. Annuity guarantees rely on the financial strength and claims-paying ability of the issuing insurer. Any references to protection benefit or lifetime income generally refer to fixed insurance products. They do not refer, in any way to securities or investment advisory products or services. Fixed Insurance and Annuity product guarantees are subject to the claims‐paying ability of the issuing company and are not offered by Retirement Wealth Advisors, Inc.
Million Dollar Round Table (“MDRT”) is a membership organization. Qualifying criteria for membership includes attaining specified levels of commissions earned, premiums paid or income earned on the sale of insurance and other financial products. MDRT membership requirements include the payment of annual dues, compliance with ethical standards, and maintaining good standing with an MDRT-approved professional association. The MDRT logo and/or trademarks are property of their respective owners and no endorsement of Gina Wells or Advanced Capital Group is stated or implied. MDRT and Retirement Wealth Advisors, Inc. (RWA) are not affiliated.